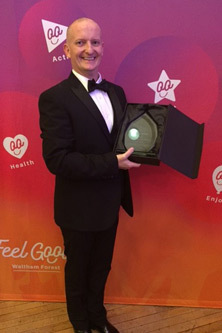 A midwifery lecturer from the School of Health Sciences at City, University of London has won the synchronized ice skating Adult Team of the Year award at a recent ceremony in Waltham Forest. Jamie Richardson, who recently joined the Division of Midwifery and Radiography, also won a silver medal performing some skating skills at Alexandra Palace in North London in a separate event. Jamie first got into synchronised skating nine years ago as part of a ‘learn to skate’ program being held at his local ice rink in Lee Valley. The sport itself is unique and involves a line of 10 to 16 ice skaters all performing the same moves to a choreographed piece of music.